Episode No. 179 of The Modern Art Notes Podcast features artist William Pope.L and historian Miles Orvell. 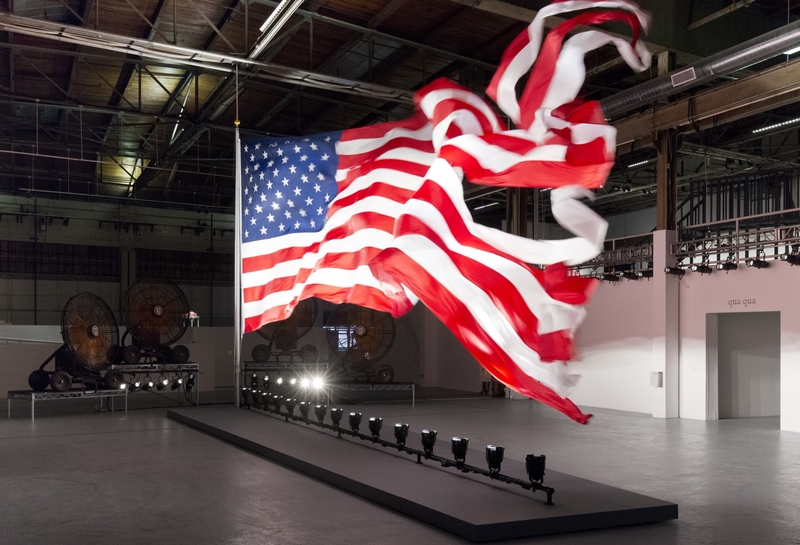 During the 2008 presidential campaign, Pope.L installed Trinket, an over-sized flag animated by an artificial wind storm, in Kansas City’s Municipal Auditorium. The installation, organized by Grand Arts, was only on view for a week. Now, with another presidential campaign having kicked off, Trinket is back. 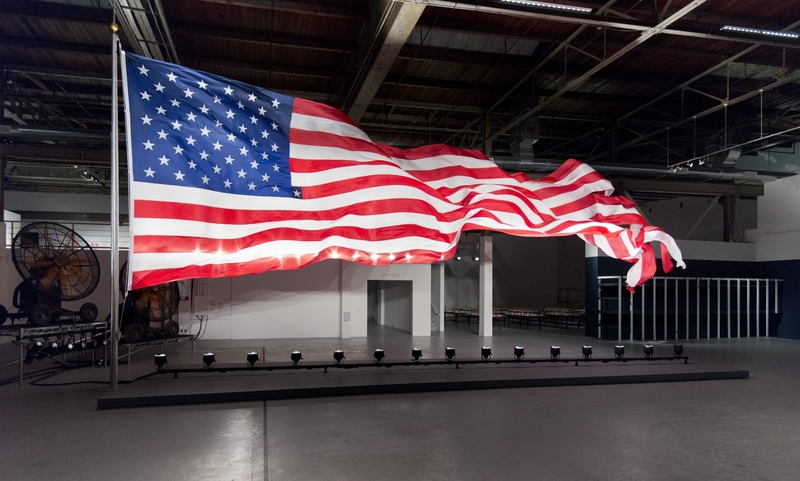 This time Pope.L has installed it at the Museum of Contemporary Art in Los Angeles with a flag that measures 54-feet-by-16-feet. The exhibition, which was curated by Bennett Simpson and is on view at MOCA’s Geffen Contemporary location through June 28, includes several other Pope.L works, including Small Cup, a video in which a U.S. Capitol-like cupola is transformed and ultimately consumed. Pope.L’s work has been the focus of solo exhibitions at the Art Institute of Chicago, at Kunsthalle Wien and at the Santa Monica Museum of Art. His work is in the collection of MOCA, the Museum of Modern Art, New York, the Whitney Museum of American Art and more. Air date: April 9, 2015. William Pope.L, Trinket (installed at the Museum of Contemporary Art, Los Angeles in 2014), 2008. 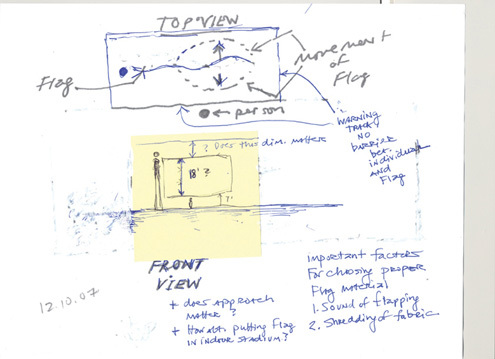 William Pope.L, Preliminary sketches for Trinket, 2007-08. 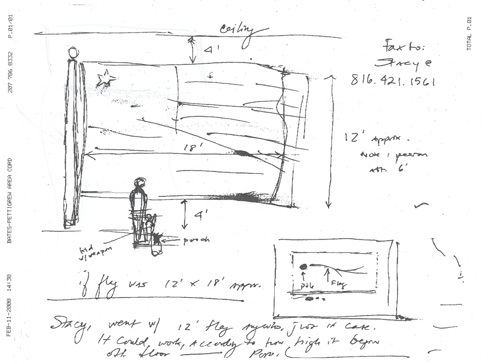 William Pope.L’s “The Great White Way: 22 Miles, 5 Years, Part One” on UbuWeb.